Find San Diego Marriott Mission Valley deals, discounts and special offers. 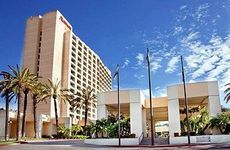 Centrally located near popular San Diego attractions, this hotel has 350 rooms and luxury accomodations. Located in the heart of San Diego, this hotel has meeting rooms, a pool, tennis court and fitness center. A stylish boutique hotel located adjacent to the Gaslamp Quarter of San Diego. Ideally located in the historic Little Italy area of downtown, offering beautiful views of San Diego Harbor. Hip hostel style hotel with shared bathrooms in San Diego. This hotel is located on the famous San Diego Hotel Circle near Sea World and the San Diego Zoo. This hotel is just minutes from downtown San Diego's Gaslamp Quarter, the San Diego Convention Center, and SeaWorld. Located in the Gaslamp Quarter, the hotel is near Petco Park and has an outdoor bar with fire pits on the 9th floor. Located near the Gaslamp Quarter, this hotel offers in room spa services and a 24 hour yoga center. Enjoy an unforgettable stay aboard your own private yacht or floating villa, docked in San Diego Harbor. Just one mile from SeaWorld, this hotel features an outdoor pool with large sundeck and a video game room. Historic hotel conveniently located close to beaches, shopping, and San Diego attractions with pool and fitness center. Located on Hotel Circle in the Heart of San Diego. This authentic Queen Anne Victorian Bed and Breakfast has 9 luxurious rooms with private bathrooms.